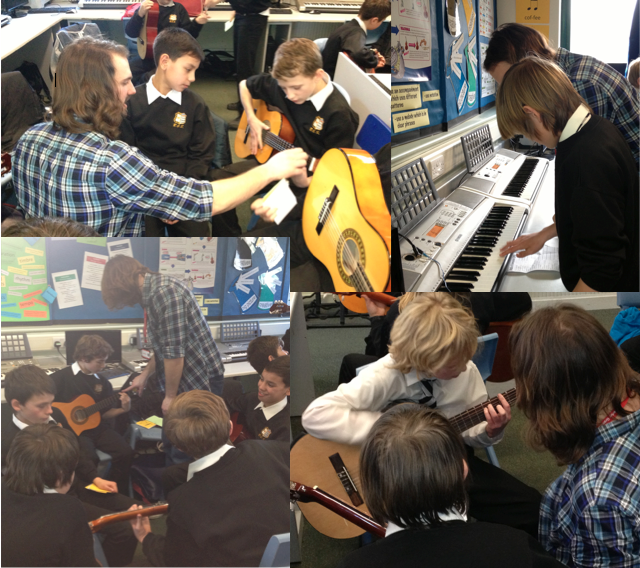 Dan Robinson, a professional guitarist visited five Year 7 and Year 8 Music lessons this week. He performed a selection of song extracts to the students, as a Year 8 pupil described, acting as a “human jukebox”! The requested songs ranged from AC/DC’s ‘Highway to Hell’, Ed Sheeran’s ‘A-Team’, The Beatles ‘Help’ to the theme tune from the TV show, Noddy! Students were instantly engaged by the phenomenal selection of songs which Dan played, without any sheet music, chords or notation! Classes then discussed the links between what they had seen and heard, and their current learning. Dan then helped students with their performance work, either learning the 12 bar blues or creating an Axis of Awesome-style, 4-chord song performance. Comments from the workshop lessons were very positive with students feeding back that they felt it was “awesome”, “the best thing ever” and “great to hear a wicked live guitarist”. Hopefully, this has inspired the next generation of guitarists at Beverley Grammar School.